My favorite character of the entire Mara Dyer trilogy was definitely Noah Shaw, and now this long-time book boyfriend is getting his own book! However, the synopsis suggests the sinking of my ship, and I will not have this! This series definitely has the potential to kill me haha. For too long our people have suffered, plagued by overcrowding, disease, and lack of work. We have only just survived for too long. Now we must take the next step and thrive.Pacifica.A new beginning. To say that I loved Kristen Simmons Metaltown is a severe understatement. Her writing is so realistic and relatable and I can't wait for her new book. Wow! Both books sound interesting! Great picks! Thank you! I hope you added both of them to your TBR if they weren't already there! I am happy to see here TBR list of your book in which some funny book also. And my students are excited to read such kind of books who are usually seeking history essay writing help - http://www.essaywriter.org.uk/history-essay/ with a pass guarantee & unique quality work from the best essay writers at Essay Writers UK. Simon & Schuster Books for Young Readers is a sound like interesting and I think it would make a hit with a wide range of booklovers. Very unique and classy cover page of book “The Becoming of Noah Shaw”. A very attractive blog and thanks for taking time for show us your writing skill and talent. The college girls who love to read love story book with their friends would be sure like this book who are also taking psychology assignment help - http://www.assignmenthelpfolks.com/psychology/ from the Assignment Help Folks because this is the consultancy which provide quality academic writing help with pass guarantee in students examinations. Yaas!!! Sooo excited for Noah's book!!! I hope your ship won't sink with The Becoming of Noah Shaw. And I also really like the sound of Pacifica! Oh I hope not, my heart will break haha. I hope you added Pacifica to your TBR! I'm so excited for Pacifica and I know Kristen is an amazing author so I'm sure it's going to be great! I'd be really curious to see what you thought of the Mara Dyer series, and I hope you get to it soon. OMG Pacifica sounds so good!! I need it! I only read the first book in the Mara Dyer trilogy. I don't know why I never finished the series. I hope this new companion series doesn't break your heart, Brittany! Oh, I hope so too. I guess we'll find out haha. I hope you pick up the sequel to The Evolution of Mara Dyer soon! You and I were almost twinning! I featured The Becoming of Noah Shaw last week. I hope this new book will be good! I'm scared but more excited than anything else! I've loved Simmons' books and I can't wait to read this one. You must read her Article 5 series! Also The Glass Arrow! TGA was my favorite of hers. That's really cool! But we usually want the same books so I'm not too surprised haha. The Glass Arrow and Article 5 are on my TBRs but I'll probably try them as audiobooks if they exist. LOL! I was wondering why the cover for Noah Shaw looked familiar. Totally need to start the Mara Dyer trilogy now. Oh and Pacifica? Great choice! Hope you get them both! Yes, you should read it before The Becoming of Noah Shaw comes out! "So where are the First Five Hundred really going?" Man just this makes me want to read the book! I guess I found a new book to read!!! I've got to finish the rest of the Mara Dyer series. Great pick! I think Pacifica looks good as well. I'll have to add it to my TBR list too. Thanks for visiting my Wednesday post at Lisa Loves Literature earlier! Both of these sound fabulous! Great picks! Pacifica sounds so amazing! What an awesome pick - I hadn't heard of it until now, and now I'm super excited to read it! Oh, I loved Noah! Great pick! Eeeeek such great picks! 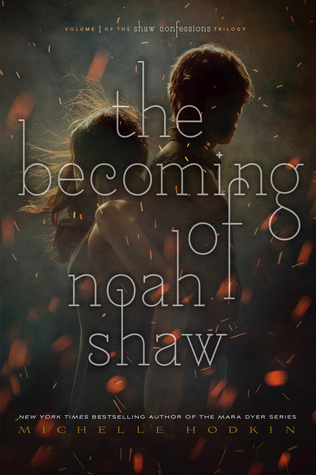 I absolutely love the cover for The Becoming of Noah Shaw, and I really need to start reading the Mara Dyer series! Hope you love these when you read them, Brittany :) And thanks for visiting my WoW yesterday! Don't hate me, but I've never hears of Kristen Simmons before.. but you definitely sold me and I need to check out her books asap! I love when writers are realistic and relatable, it makes the books so much better. 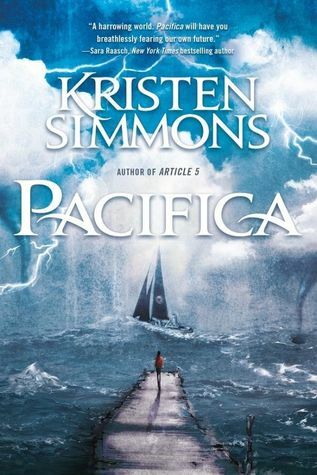 I haven't seen read Kristin Simmons yet but I definitely want to read Pacifica. That one's new to me and looks awesome. WHY IS THAT COVER SO AMAZING I LOVE IT I WANT IT IMMEDIATELY. GO READ THE LAST MARA DYER BOOK CAIIIIIIT. AHHHH I AM SO INCREBILY EXCITED FOR A NEW MICHELLE HODKINS BOOK! Noah might be one of my fave characters of all time. Also, Pacifa sounds amazing. I haven't read any of the Mara Dyer books but now I kinda need to!!! This is my first time hearing about Pacifica and it sounds amazing!! :D I didn't get a chance to read Metaltown so I'll have to make time for it since you loved it so much! Thanks for sharing about these, sweetie!